Perhaps His Holiness is receiving some kind of 'reality check' from the crowds in Rome who, I am told by a priest who returned from Rome recently, received somewhat lukewarm applause from the Roman crowd, who saved their biggest cheer for the moment when the Pope Emeritus was brought out for the day. I must say I was a little alarmed when the Pope Emeritus says he only goes out when the Pope invites him but I guess we shouldn't read too much into whether that's a 'self-imposed' 24-hour curfew from the retired Pope or something else entirely. Let's face it. There are already enough conspiracy theories concerning Benedict XVI's abdication to keep those interested up all night. He did say he would live a 'hidden' life. The priest I talked to about his visit to Rome is, it has to be said, completely disillusioned and utterly depressed concerning this pontificate. I decided to take a screen-shot of the YouTube homily which you can view here today at Rome Reports because for Pope Francis to ask that question is bizarre and topical. It possibly hasn't filtered up to the top that there are now more than a few Catholic websites dedicated to 'Pope Francis: the False Prophet of Revelation' and hitherto perfectly reasonable Catholics are asking just the question that His Holiness asked today. Who is feeding this insatiable frenzy of Catholics going to such websites for consolation and answers to their bewilderment? Well actually, quite frankly, it is the Pope. His Holiness can hardly blame Maria Divine Mercy for her popularity. Perhaps His Holiness is her advertising agent. I guess its no worse an offer than Porsche. Back to the homilies. By now you must realise that when His Holiness says there are 'three kinds of Christians' that there are in fact, around 199 different types of Christians so far, because this is a consistent homiletic strategy from the Pope. I believe its a Jesuit 'way in' to a homily. Anyway, there are another three types today. "They are the Christians of gray areas. And these Christians of gray areas are on one side first and then the other. People say of these: 'Is this person with God or the devil?' Huh? Always in the grey area. They are lukewarm. They are neither light nor dark. And God does not love these. In Revelation, the Lord says to these Christians of gray areas: 'No, you are neither hot nor cold. If only you were hot or cold. But because you are lukewarm – always in the gray areas- I will vomit you out of my mouth'. The Lord has strong words for these Christians of gray areas. 'I am a Christian, but without overdoing it!' they say, and in doing so cause so much harm, because their Christian witness is a witness that in the end only sows confusion, it sows a negative witness". Hmm...What a thoroughly exciting, terrifying, fingernail-biting Synod that was? Does anybody know yet whose side the Pope was on? I'm itching to know and I think I do know, but there's still this little hopeful part of me that hopes against all odds that the Pope is still Catholic, or, at least, the new one. I am so confused by this Papacy I don't have a clue what is going on, where the Pope really stands on anything. I'm still left a little confused. In fact, every day I find his comments and the lack of transparency in Rome confusing. I'm confused at the 'de-Ratzingerisation' of the Vatican. There is nothing terribly clear about this papacy. It's like driving in a dense fog. Even when his opinion is made clear something, you still have a nagging feeling that that is simply the opinion (life imprisonment, the death penalty, the Big Bang, evolution etc) of Jorge Bergoglio, the man, rather than that of the more hitherto carefully constructed and balanced positions of the Catholic Church. More worrying than what Pope Francis says is what Pope Francis does. More worrying than what Pope Francis says and does is what we are not told. More worrying than all of this is what Pope Francis says we should not do, he manifestly does with, seemingly zero problem for his conscience. This is the reason I ask, the question: Is Pope Francis okay? Is Pope Francis 'all there'? In the case of this Pope, I don't know what is more terrifying at this moment - the idea that the Pope has lost touch with reality or the idea that the Pope knows exactly what he is doing, and does and says what he does with meticulous fore-thought and knows its completely contradictory. Out of the two, I'd rather that His Holiness is, well, quite frankly, not of sound mind. 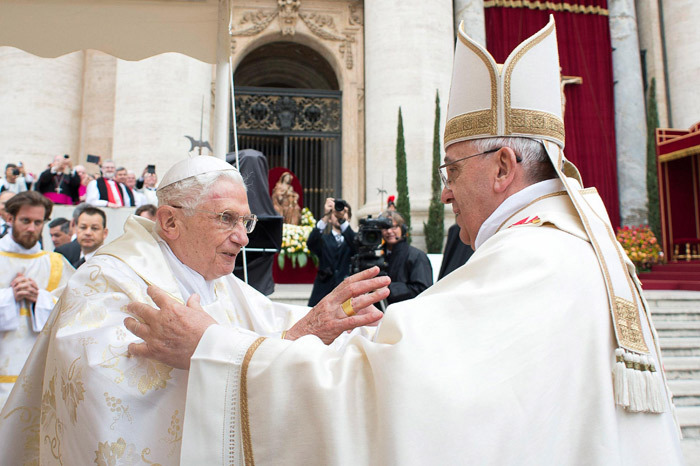 Much was said that was negative of Benedict XVI within and without the Church. What could never be questioned was the clarity and soundness of his mind. I know what you're going to say. You're going to say. "Sound mind? You're a fine one to talk!" Well yes, but you see, I'm not the Vicar of Christ on Earth. The Church can deal with a layman who is a fruit-loop. You'll usually find a few in every parish. It cannot cope so easily with a fruit-loop Pope. Cardinal Kasper claimed that the Pope has a 'hundred year plan' for the Church. If true, you have to say that is both a mark of his humility and ambition. Josef Stalin only planned five years at a time. Happy Feast of St Simon and St Jude to all readers. I look forward to the day when the question: "Is the pope Catholic?" Automatically understood to be merely a rhetorical question. Reliably, at least bears still do what bears do in the woods. There is no basis for any reasonable doubt that the Pope is anything other than of sound mind - and so fit to be tried for his opposition to the Deposit of Faith and the Divine Law. ALL CATHOLICS ARE MORE THAN WELCOME THERE!!! "At What Point Can Catholics Question the 'Soundness of Mind' of the Supreme Pontiff?" When they have the appropriate qualifications in psychiatry and have been lawfully engaged to provide a diagnosis. There are, I fear, far too many amateur psychiatrists. I never saw stupidity as a disease. But thinking again it can be some kind of moral sickness. Anyway, he is a nightmare and a disgrace. We have suffered him in Buenos Aires for too many years. Lets pray that the future of the Church woouldn´t be like Argentina´s present. This is Francis' choice though, at the beginning of his pontificate he made the point to try to give the homily at all his Masses. Well, there are a lot of days in the year. 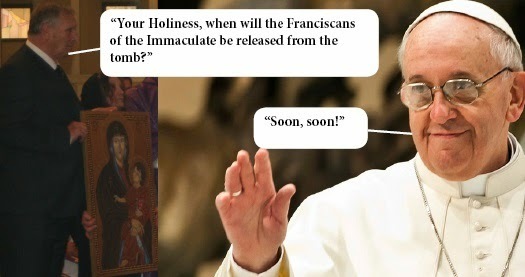 I expect plenty of weak and questionable homilies, even BXVI didn't always hit it out of the park. The problem is which homily will the media go gaga and drool over, the one that is actually sound or the one that sounds like a capitulation. The current Pope by his words, actions and love affair with the Jewish rabbis and their occult Kabalah system shows which god he follows. Remember God has put a veil over the Jewish people who crucified his Son(God in the flesh) which causes them to not see the truth and believe in lies. The Talmud is filled with lies along with the kabalah system which turns good into bad. I believe Francis probably is part of the serpent seed of Cain and nothing will stop him from destroying the church. The more he destroys the church the more his sermons will become nonsensical. Hopefully true Christians will wake up and see him for what he is. I am starting to realize that the occult numbers like 33 (age of Jesus death) or 9/11 (day of Jesus birth) are used to promote evil to glorify satan. Revelation 11-19 shows the arc and the temple in the sky before Rev 12 with the woman clothed with the sun..Coincidence the number is reversed? At the very beginning of this Papacy, there were people (including a few who appeared to be well qualified to comment) who questioned the Pope's mental balance but I have read nothing recently raising this concern. This surprises me because if his early comments appeared odd/inconsistent/un-Catholic/lacking self-awareness etc. then he has certainly provided a lot more 'ammunition' since the early days. The good thing is that he has ended the faith and reason project of his immediate predecessors. The problem is that he refuses to examine why they adopted this flawed plan in the first place? My contention in 2013 is that the see of Peter should have been left sede vacante following the resignation. Nothing has occurred since then to change that view. This graydualism is rather ageist, isn't it? Another one for the Little Book of Insults, surely. I started posing just this question on another website after around 3 weeks of this pontificate. Within that space of time we had heard: "Whenever we are not praying to Jesus Christ, we are praying to the devil. ", followed soon after by "Of course atheists will go to heaven, by the goodness of the lives they lead." Then of course there are the homilies castigating people who gossip and use insults which terminate in using insults against those people. And at the close of the Synod we have had the criticism of those who are too bound to the word of the law, which was followed by a restating of his own authority by quoting the word of Canon Law. With these endless contradictions, it is no wonder that people question the papal marbles. It is certainly kinder than proposing diabolical disorientation to be the cause. I don't have psychiatric qualifications - I only studied neurobiology at the molecular and cellular levels. But like many people, I do have a parent who has been diagnosed with dementia and it is usually the non-professionals who spot the problems long before the professionals are called in to confirm the diagnosis. I suggest that if he was surrounded by people who actually cared for him, somebody might have been called in by now. I don't know enough about the rules for conclaves, but as many of these candidates are elderly men, does anybody know if there are procedures for verifying the soundness of mind for candidates for the papacy? Anyway, we have plenty of reasons to offer prayers and sacrifices for him. Did you notice at the end of the Rome reports video that he said: "God doesn't love these (grey) Christians."??? We had better pray that he didn't mean that either. Wonderful article! Please keep writing things like this. Heart breaking .. perhaps it is the end of days and the devil is getting one last crack at the church before the next phase of human history takes place.. no wonder lightening hit the Vatican .. not once but twice the day Bendict left.. I think it was a sign from God .. of what was about to transpire... I still wonder why Benedict left .. its like he just handed us over to the worst kind of politicized Gramscian Freudian person on the plant .. cultural marxism is alive and well and we have an example of it in Francis.. but God is good .. sooner or later HE will sort it out . he always seems to send a saint about the time we need one.. I pray our era will have one soon . but Francis is not it.